St Peter & St Paul, Burgh Castle01493 781747work ChurchParts of the present church of St Peter & St Paul but it is reputed that in 633 AD St Fursey came from Ireland and established a monastery within the then abandoned Roman Fort. 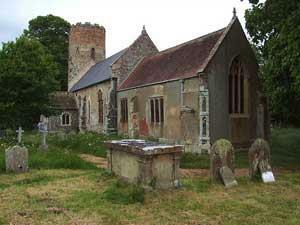 The small round towered church consists of nave, chancel and north aisle. Points of interest to the visitor are a well preserved 14th century East Anglian lion font and some magnificent stained glass windows, especially the small lancet 'Fursey' window. During the summer months the north aisle houses permanent displays and information relating to St Fursey and also the Roman fort. Parts of the present church of St Peter & St Paul but it is reputed that in 633 AD St Fursey came from Ireland and established a monastery within the then abandoned Roman Fort. The church is open daily from 10am - 5pm from April to October and 10am -3.30pm in November.